Independent candidate Sumalatha on Saturday alleged that CLP leader Siddaramaiah did not campaign for JD(S) candidate Nikhil Kumaraswamy willfully. JD(S) leaders forcefully brought him for campaigning. 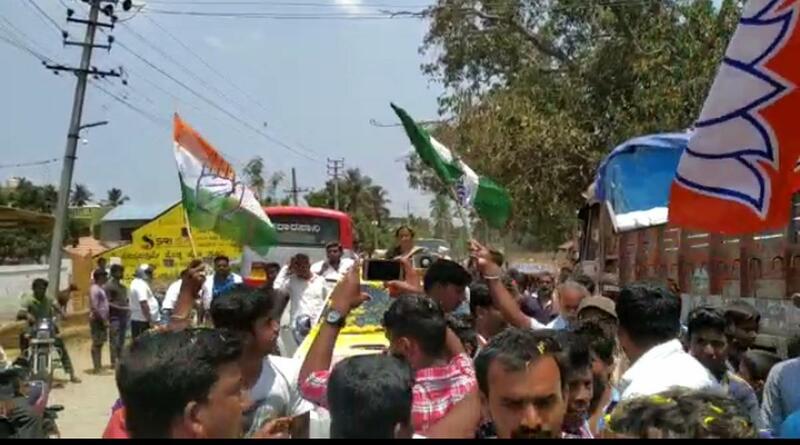 Addressing a gathering during the campaign at Gollarahalli in Malavalli taluk, in the district, she said, Siddaramaiah was blackmailed by the JD(S) to campaign for Nikhil. "Siddaramaiah did not campaign willingly,” Sumalatha said. “Siddaramaiah urged the voters not to support the Independent candidate against his wish due to the pressure from JD(S). There will be no change even if All India Congress Committee president Rahul Gandhi campaigned for Nikhil,” she taunted. “JD(S) supremo H D Deve Gowda should treat us as his children as we are respecting him like father. But, JD(S) leaders are doing politics in the death of my husband M H Ambareesh. Chief Minister H D Kumaraswamy is making loose comments without respect for women,” Sumalatha charged. "Kumaraswamy has no concern for farmers and is disrespecting soldiers with his statements. Kumaraswamy would understand the value of soldiers if he had sent his son to army rather than making him MP," she said. In Konnapur village, Malavalli taluk, people, irrespective of political parties, welcomed Sumalatha and extended their support. The supporters of all three parties, holding their respective party flags, extended support to the Independent candidate. Sumalatha said, this is history and beauty of Mandya. “Have you seen all three party flags coming together in any part of the country? It proves that Ambareesh had well-wishers irrespective of parties," she said..
Later, in Nittur, the native of former IRS officer Lakshmi Ashwingowda, Sumalatha said, "JD(S) did injustice to Lakshmi. JD(S) made Lakshmi to quit her job, by assuring a good position, but, was now neglected."